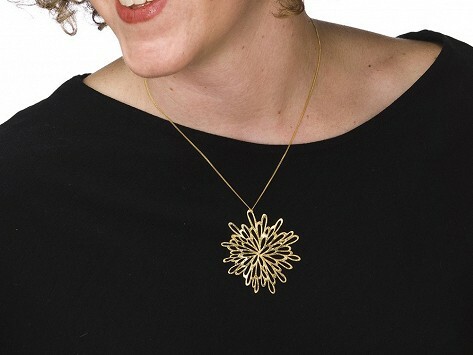 Hand-drawn, laser-cut jewelry pendants that come still attached to the metal plate from which they were cut. I ordered a red one for myself and this one for a gift. Very happy with both. The pendant is very pretty. The only improvement that I would like is the inclusion of a ring from which the pendant would hang from the chain. This is a nice piece, but it was larger than I expected and I thought a bit over-priced.